More than 100 years ago Intrepid Birdmen in aircraft cobbled together from anything they could find were taking to the skies in air races, this just a few years after aviation was even a thing. And just like ‘Those Magnificent Men in their Flying Machines’ a new breed of adrenaline junkies with the skills to build incredible contraptions are at it again. 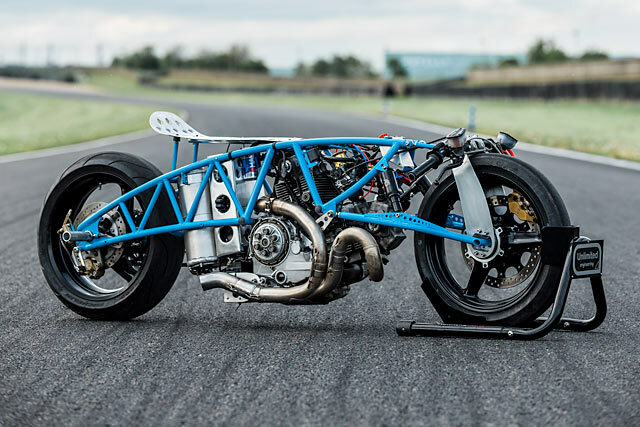 They’re called the ‘Sultans of Sprint’ and the asphalt 1/8th mile is the troposphere where they do battle, on bikes as bananas as those old planes. 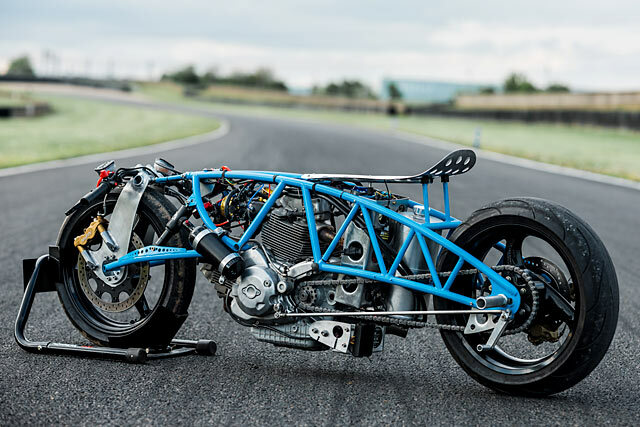 Very few fulfil that centuries old ethos like Belgium’s Bernard Mont and in 2018 he’s returned with a lay down and mash the gas, hub-centre steer Ducati. It’s known as Nowhere Faster. Originally from the village of Mettet, Bernard shares a racing pedigree as impressive as the nearby circuit where winners include Agostini, Surtees and Duke. “My professional career began at the end of the eighties in race cars, in the French Rally Championship, European F3000 Championship and Belgian Production Championship…” explains Mont, trailing off as he reminisces about his years of speed. 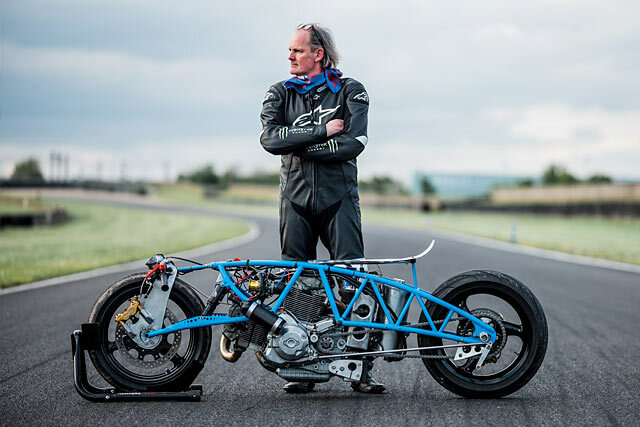 By day he’s spent the last 25 years as a mechanical engineer, while in his down time he runs a small Ducati tuning business. And in his “free free time” as he calls it, he builds bikes for himself like Nowhere Faster. 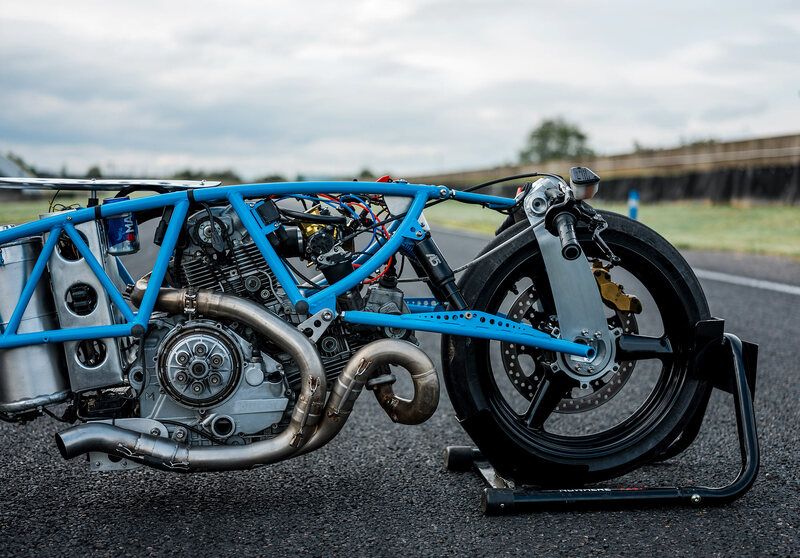 “My first complete project was the “Ducati TT3 Difazio”, a tribute to Taglioni and Difazio built in 2012. 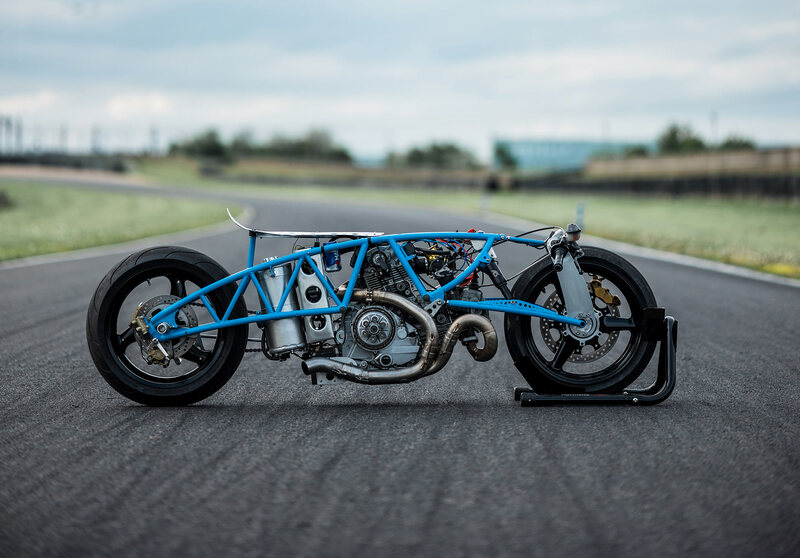 That bike won the “World Ducati Week” 2014 “Garage contest”. 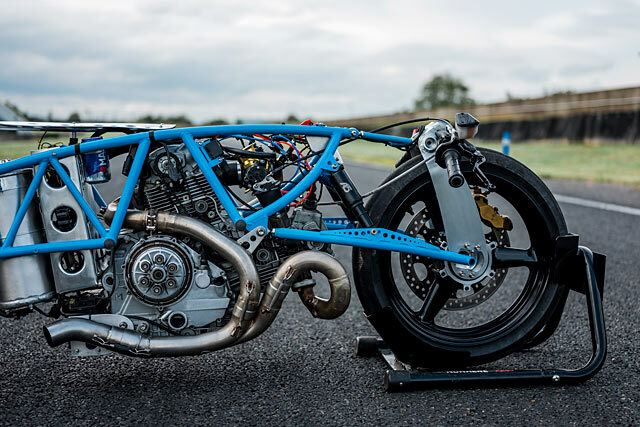 While last year he competed in the Sultans of Sprint series aboard a Ducati Monster S2R also fitted with hub steering called ‘Nowhere Fast’. Now he’s back with the ultimate tip of the cap to Taglioni’s Ducati dreams and Difazio’s desire to do steering better with the bike that sits before you, ‘Nowhere Faster’. “For 2018 I decided to build a specific bike for this challenge. 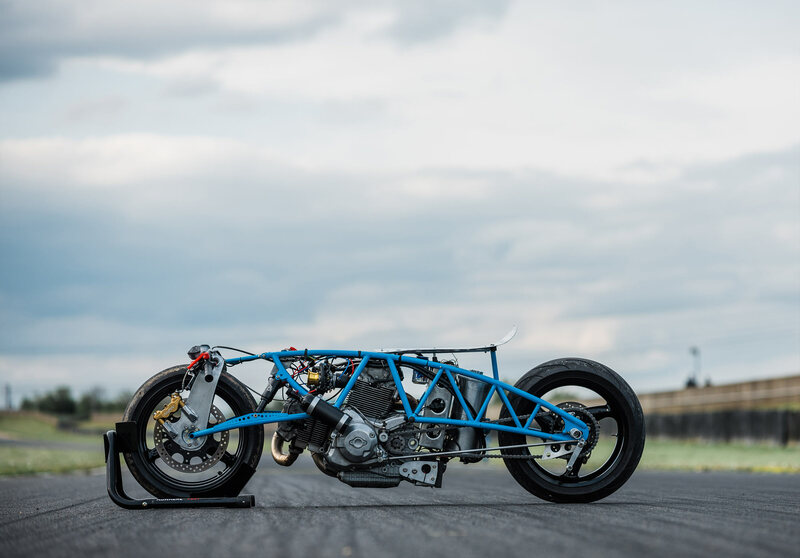 The project started in October 2017 with the design (autocad) and build of the frame and other parts,” Bernard tells us. 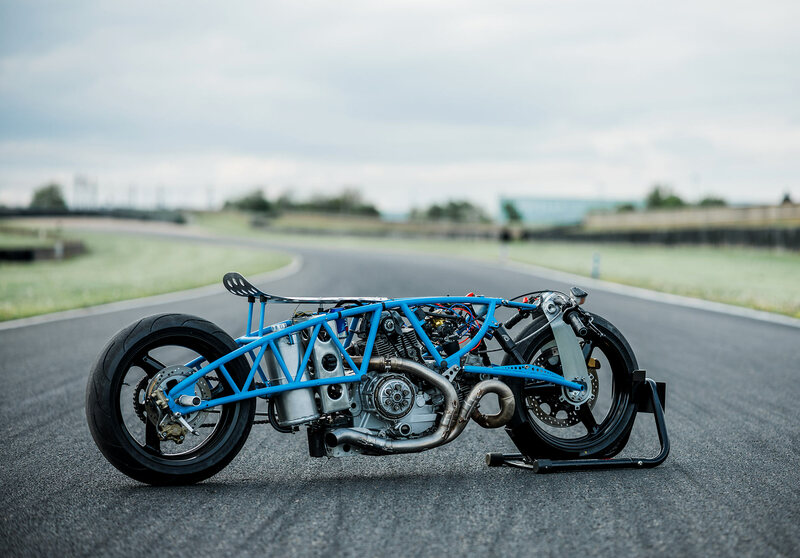 The totally one-off frame uses a Ducati, trellis like design, fabricated from thin wall chromoly and all meticulously TIG welded together. 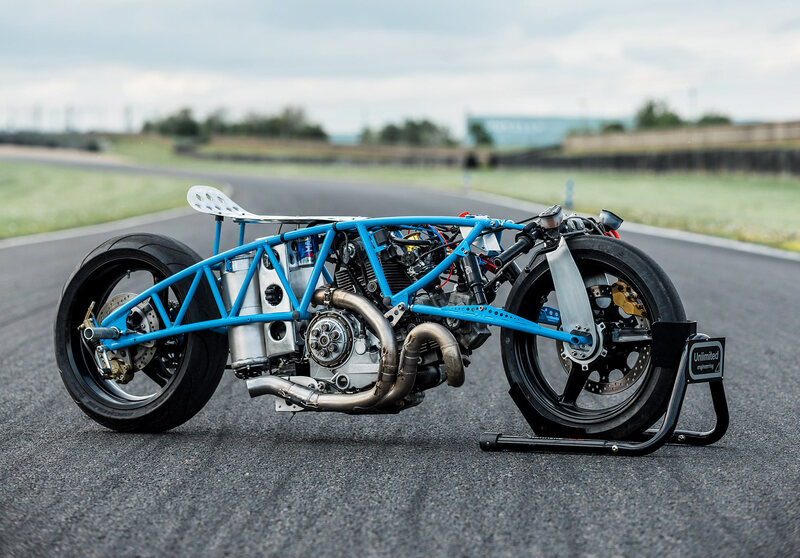 The idea was to create something light for the best power to weight ratio while staying long and low to reduce wheelies off the line. At just 64cm at the highest point you don’t so much as sit on the bike as you do lay down. 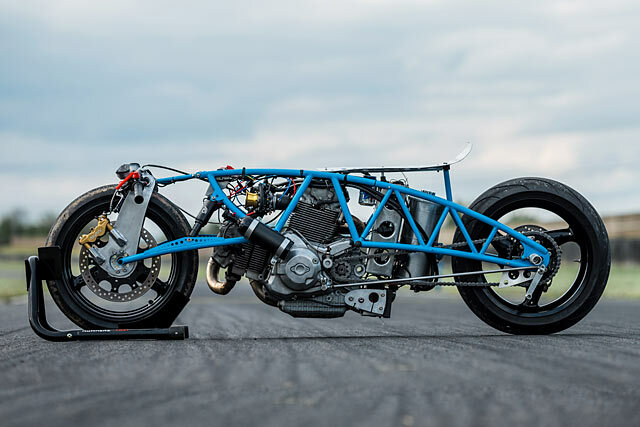 Another inspiration for the design came from European drag racers of old Herman Jolink and Dany Dieudonne, but Bernard also had an ulterior motive for the fenderless design. “The exoskeleton look, is a very positive point for me as I HATE doing bodywork,” he laughs. 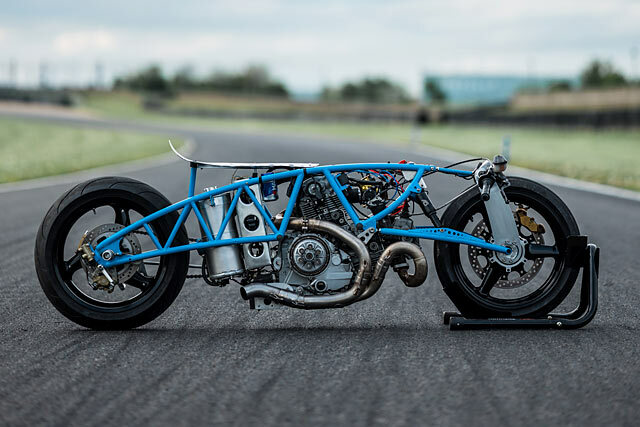 But what really sets the bike apart is the continuation of Bernard’s obsession with hub-centre steering, particularly the likes of which made famous by Jack Difazio. 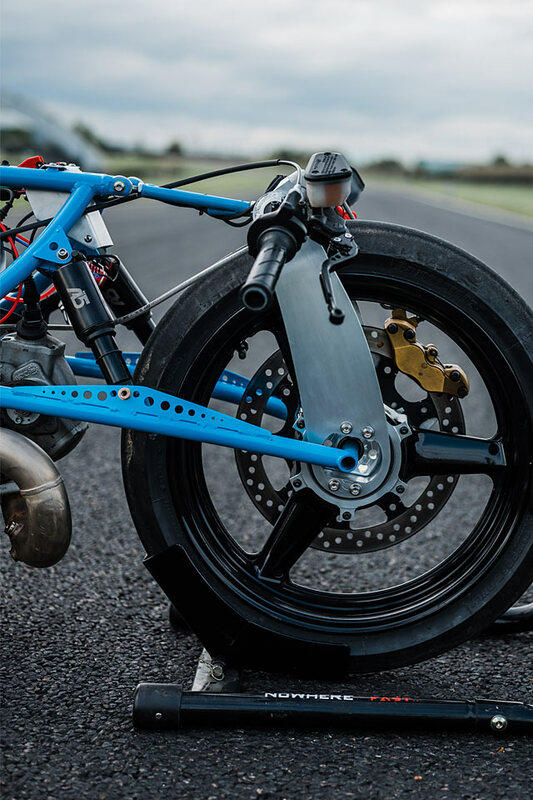 The front wheel and disc is from a Yamaha R1, all heavily modified to work with the system. The vertical arms are fixed length meaning there is no diving like a conventional fork, while the tie-rods holding it all together send forces along a horizontal plane where dampening is provided by a pair of shocks originally intended for a bicycle. Adjustability on the upper tie-rod and lower shock mounts means weight transfer can be tuned for the perfect getaway. 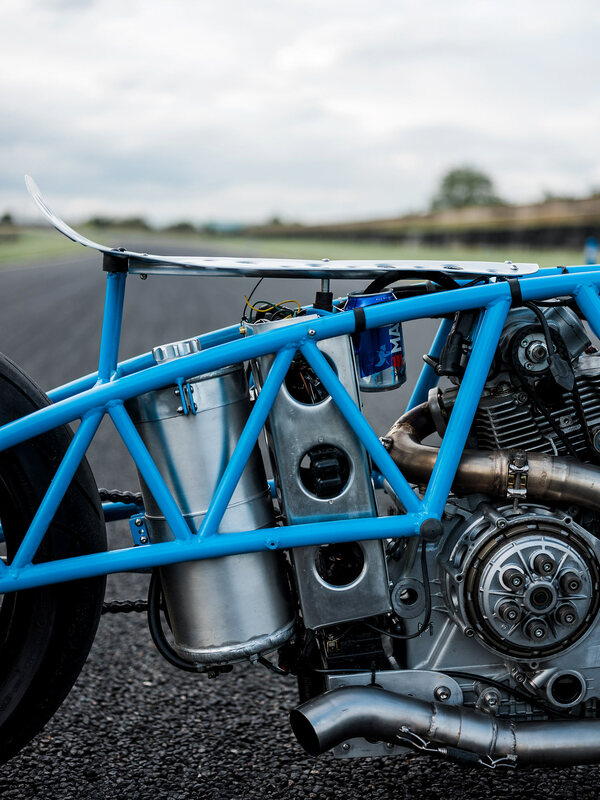 The accuracy it provides in the steering allows Bernard to keep the bars very narrow to reduce drag. 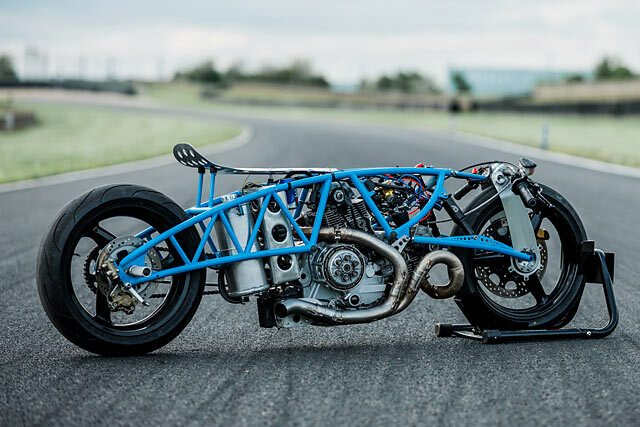 The hand bent bars wear just the necessities, with a quick action throttle, adjustable levers and twin reservoirs for the hydraulic clutch and brake. The stopping power comes from a caliper off a Triumph Speed Triple for plenty of bite at the end of the run. While seating is all about function over form with a long punched aluminum seat keeping the riders mass evenly spread over the back bone; meaning the pegs are all the way at the rear axle. 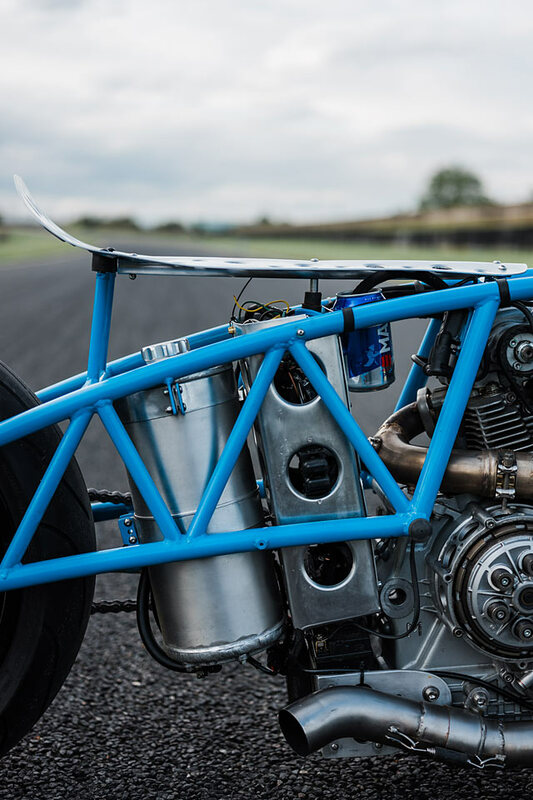 A custom fuel tank sits near the rear tyre, with the Nitrous bottle up front for uniform weight distribution. Firing the crazy contraption down the road is a Ducati engine from a Multistrada 1000 DS. Internal its relatively stock and with a smile Bernard tell us it retains the “starter and battery due to my age.” A few small concessions aside its nothing like the engine you’ll find in the tourer it comes from, allowing the engine to spool up fast is an ultralight flywheel. While externally short length velocity stacks are all about top end power aided by a considerable shot of Nitrous. At first glance the exhaust appears to be custom-made, but it’s a clever combination of pieces from a Ducati Diavel, Monster 1200 and Monster 1000 to provide maximum flow right in the sweet spot. The dry multi-plate clutch cops an enormous amount of abuse, especially as the bike leaves the line with the revs right up. 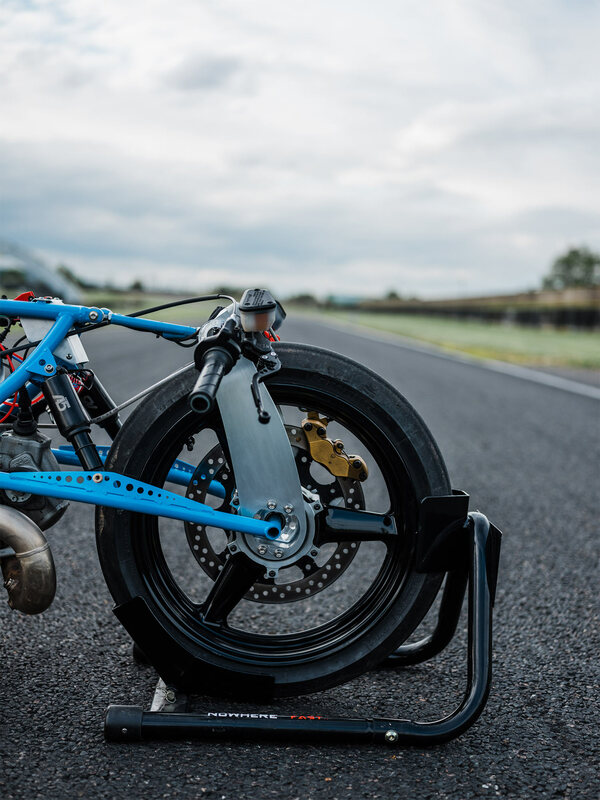 But once the rear wheel is spinning the next changes are a breeze with the addition of a quick shifter giving faster times and reducing strain on the driveline. To provide grip, “I will start the season with a conventional soft rear tyre, 17” 180mm wide, but I can upgrade to 18” with slick drag tyres if necessary (technical rules allowing),” explains Bernard. 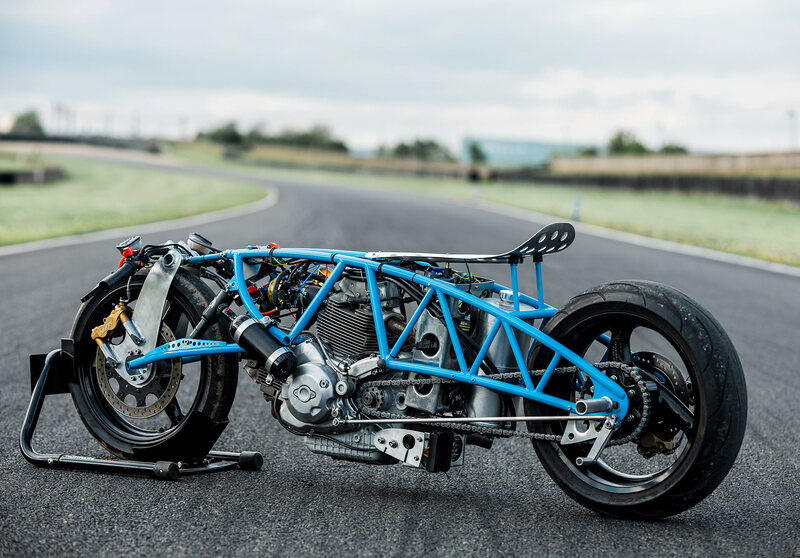 A departure from last years jet black bike the sky blue paint shows off the incredible frame and all told ‘Nowhere Faster’ achieves the perfect 1:1 power to weight ratio. 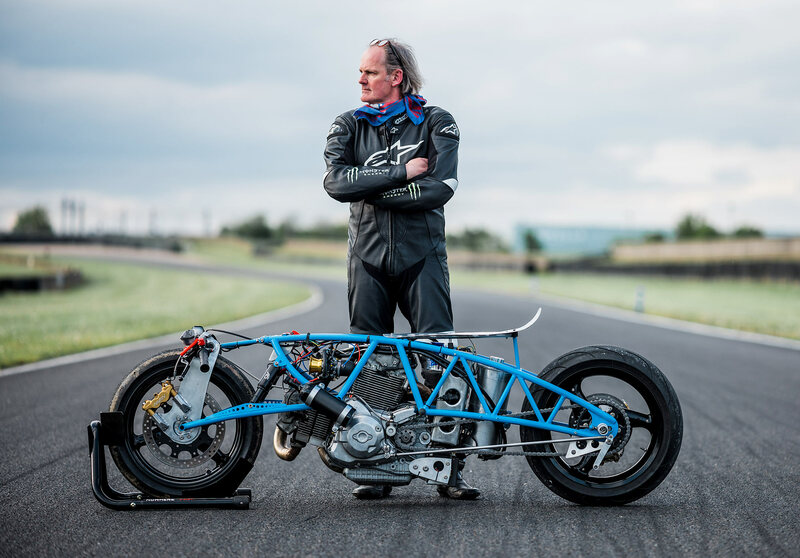 The proof will be at the track but it’s an incredible outcome so far from this magnificent man and his racing machine, who did it all at home, with a little help from his friends.